Sakai Guides and DocumentationSakai Complete User Guide LessonsHow do I upload content in a zip file on a Lessons page? Instructors can content packaged in a zip file to a Lessons page. This is useful if you have content that is pre-packaged as a self-contained archive, such as content objects created using Camtasia, Wimba Create, Articulate, or other content authoring tools. Click Add Content, then Upload content in ZIP file. From the Add Content drop-down menu, select Upload content in ZIP file. Enter an item name and select the file. Enter an Item Name. The item name is the text that will appear on the Lessons page as a link to the zipped content. Click Choose Files to browse for the item on your computer and upload it. Alternately, you may click the Or select existing files from Resources to select a file that has already been uploaded to your site. Verify that the selected file is correct, and click Save. The filename of the selected zip file will display. If this is correct, click Save to add the item to Lessons. The zip content will display. 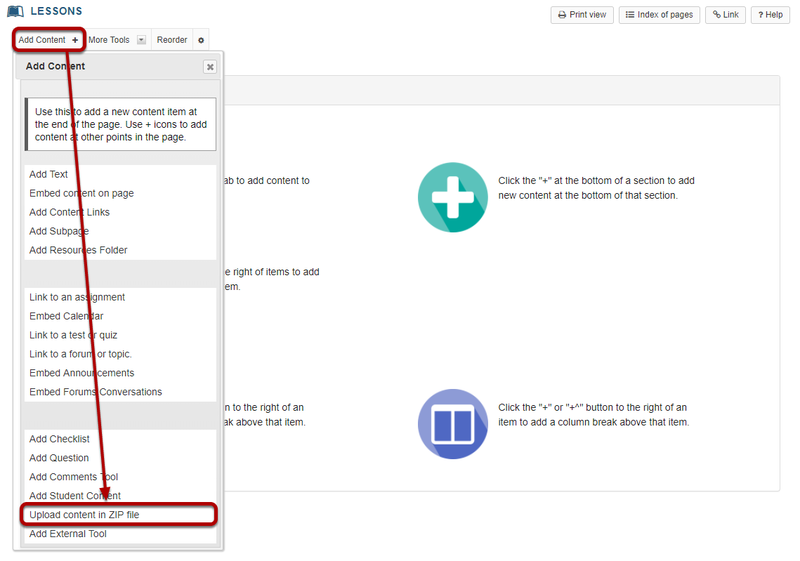 Clicking on the item link from the Lessons page should launch the index page from your zip file package. Prev: How do I add a checklist on a Lessons page? Next: How do I add an external tool on a Lessons page?